If you liked this book, read some more by the same Author or Publisher. Great help for parents who want to help their children catch up at school. 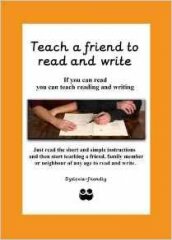 An amazing book that will change lives for the better. .
A consortium of brilliant teachers and writers to help eradicate illiteracy. You must be registered before you can vote or comment on a book! If you have registered, you can vote for this book and add a comment. You can vote for up to 3 different books within each category, fiction, non-fiction and children's within the 3 month collection period. Outside of the collection period, you cannot vote for the book but can leave one comment per book at any time. Email Address:Enter the same email address that you used when you registered. Password:This field is case-sensitive, so please ensure that your keyboard's Caps Lock is off, and respect upper/lower case when entering your password. Please note that comments are moderated, and therefore may not be immediately visible on the site. What is 17 - 4 ? There are currently no comments for this book - be the first one to tell us what you think of it!